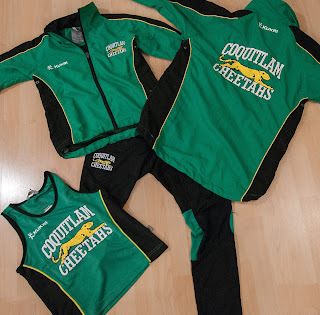 Returning athletes of all ages who need to exchange their uniform can bring their current items to the shed on Tuesday April 25th and Wednesday April 26th. This includes any uniform items that no longer fit or that are not of the current style. Current items are accented with kelly green; previous items are a darker hunter green. Exchanges will be available from 5:30pm onward and will continue until as needed or until approximately 7:00pm. New athletes will be able to sign out uniforms during the week of May 1st. Notice of those dates will be posted once finalized. All Junior Development athletes will have the opportunity to sign out uniforms before the first event of the season – the Norwesters Elementaries meet May 6th and 7th. Uniform sign-out requires a previous or new $100 deposit (cheque or cash) per athlete, refundable upon surrendering all uniform items. Returning athletes are required to return their current uniform items in order to sign out new uniform items. Exchanges and pick-ups will occur in the shed, near the high jump / javelin area. Previous athletes not registering this season may return their uniform items on any of the scheduled uniform dates. Please ensure that all pieces are returned and that the athlete’s name accompanies the pieces. If the address on the last registration is not current, ensure an updated address is provided because the refund cheque will be mailed.